I have been MIA here on posting my reading aloud challenges. And I've also been MIA on posting reviews. I can't believe I totally missed a due date. But I digress. I decided to combine the posts, because the bulk of my reading aloud this summer has been from The Adventures of Lily Lapp series by Mary Ann Kinsinger and Suzanne Woods Fisher. We started book 1, Life with Lily, again back in June. And while I'm still needing to finish reading it aloud to my kids, last night I finished reading book 3, A Big Year for Lily. Lily Lapp's family has settled into their new home in Pennsylvania, but life still holds big changes and big steps for Lily. Good changes, like once again living close to her beloved cousin and best friend, Hannah. Bad changes, like a mean girl who plays tricks on her. And no change at all where Lily would most want one--Aaron Yoder sits near her in school and relentlessly teases her. Surprises are in store for Lily as she learns, with Mama and Papa's help, to manage the ups and downs of growing up Amish. 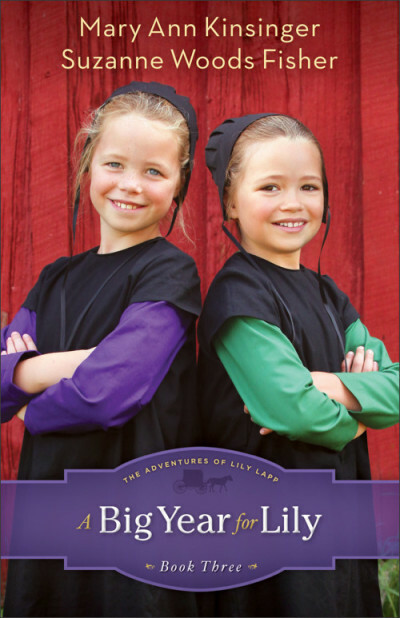 The third of four charming novels that chronicle the gentle way of the Amish through the eyes of a young girl, A Big Year for Lily gives children ages 8-12 a fascinating glimpse into the life of the Amish---and lots of fun and laughter along the way. It combines Mary Ann Kinsinger's real-life stories of growing up Amish and the bestselling writing of Amish fiction and nonfiction author Suzanne Woods Fisher. With charming line drawings in each book, this series captures the hearts of readers young and old. My kids listen, hiding their face in their hands and shaking their heads... "No, Lily. Don't do that!" I'd say they are engaged. Like the earlier books in the series, this is a fairly innocent, sweet, simple set of adventures that is sure to appeal to both boys and girls. Very fun read-aloud. I can't wait for book #4. Lauren and I are in the middle of A Big Year for Lily, too. I'll be posting about it tomorrow. Somehow I already had a linky on this post, but I put an updated one on! Thank you for posting it.